Cerberus was the triple-headed monster that guarded the gates of Hades, the realm of the dead, preventing the living from entering and the dead from leaving. As the last and most dangerous of his 12 labours Hercules was sent to the Underworld to capture this fearsome beast. He wrestled the creature into submission with his bare hands and dragged it, writhing and resisting, from the darkness of the Underworld to the unaccustomed brightness of the surface. 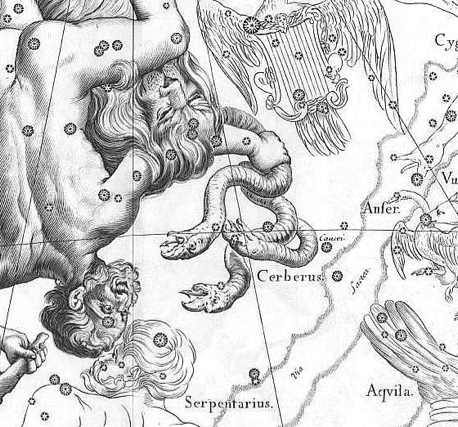 The constellation commemorating this feat was added to the sky by Johannes Hevelius in his catalogue and atlas of 1687 in which he depicted Cerberus grasped in the outstretched hand of Hercules. Cerberus consisted of the four stars we now know as 93, 95, 102, and 109 Herculi (R. H. Allen wrongly states 96 Herculi to have been a member). Although, in mythology, Cerberus was said to be a three-headed dog, Hevelius and all subsequent map makers illustrated it with three snake heads. Hevelius’s Cerberus replaced another figure, the branch from the tree of the golden apples, that Johann Bayer had previously depicted in the hand of Hercules. Bayer’s more elaborate apple branch consisted of 10 stars. Cerberus held in the grasp of Hercules, as shown on the Firmamentum Sobiescianum star atlas of Johannes Hevelius (1687). It is drawn in mirror image, as it would appear on a celestial globe. Image courtesy ETH-Bibliothek Zurich. 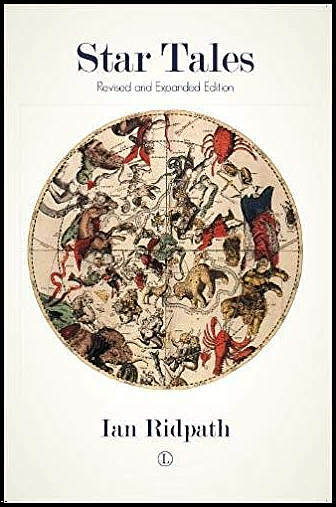 In or around 1721 the English cartographer and engraver John Senex (1678–1740), a friend of Edmond Halley, combined Cerberus with Bayer’s apple branch, Ramus, to produce Cerberus et Ramus. This combined figure first appeared on Senex’s chart of the northern celestial hemisphere, Stellarum Fixarum Hemisphaerium Boreale, which he produced from Halley’s unauthorized edition of Flamsteed’s unfinished star catalogue. The serpents in this case were wrapped around the branch. Johann Bode subsequently showed it the same way on his Uranographia atlas of 1801 (see illustration below). However, Flamsteed’s own chart of Hercules, published in his Atlas Coelestis of 1729, includes neither Cerberus nor Ramus; instead, Hercules is drawn simply grasping thin air. Cerberus et Ramus, the three-headed monster wrapped around an apple branch, shown on Chart VIII of the Uranographia of Johann Bode (1801).